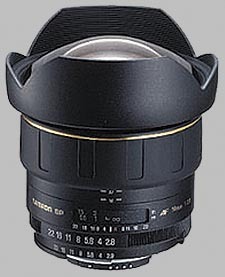 (From Tamron lens literature) The optical system of the new SP AF 14mm F/2.8 Aspherical (IF) lens, composed of 14 elements in 12 groups, includes two Hybrid Aspherical lens elements. These large Hybrid Aspheric elements efficiently compensate for aberrations thus achieving flat-field image depiction from corner to corner. With a fast F/2.8 aperture and a sophisticated optical system, photographers can create dynamic photographs that take full advantage of the rectangular characteristics of the lens. The Tamron 14mm f/2.8 Aspherical IF SP AF doesn't have any user reviews yet!